Workout by nationally known trainer, Rob Glick! Safety, usage tips and getting to know your Total Gym! Learn the fundamental movements and body positions on Total Gym, with internationally renowned Rob Glick, master presenter and trainer. Each exercise sequence builds on the previous one, and Rob guides you through the workout with expert cueing and coaching. Progress your knowledge and proficiency with Progression Two: Strength Plus. This faster paced 30-minute workout adds the next level of complexity and progression to the exercises you learned in Progression One, while adding a few extra for variety. It focuses on intensity to improve overall muscular strength and raises the cardio component as you continue your program on Total Gym. Take it up a notch with advanced exercise options in the 45-minute Progression Three: Amplified Resistance. A complete 45-minute total body workout guided by Rob Glick, popular nationally recognized fitness program developer. Amplified Resistance features more advanced exercises. 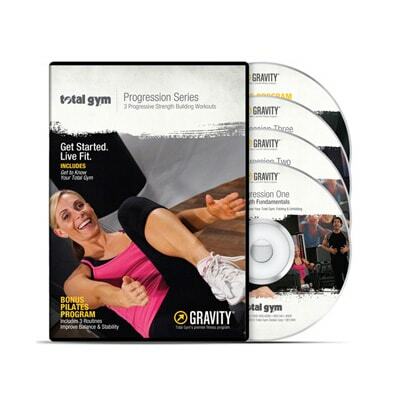 Getting to know your Total Gym, plus safety and usage tips are included to take you from beginner to advanced exercises sequences on Total Gym. Includes special section — Get to know your Total Gym and folding/unfolding instructions. 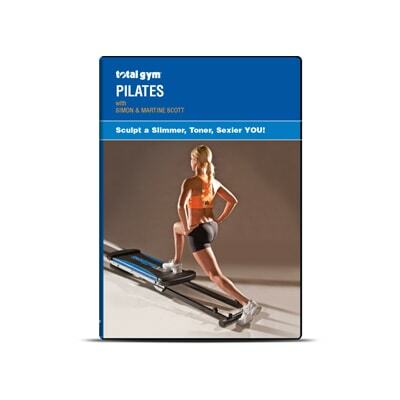 Blends the best of Pilates mat work and reformer exercises, plus unique Total Gym Pilates-based movement to allow for immediate success with Pilates training. Never before has a training platform made Pilates exercise movement so attainable that it actually assists in success. Three progressive stages offer a versatile repertoire of Pilates exercises and movement training.